This is the story of a young U.S. soldier who gave his life for our freedom in World war II. He was born at 6 September 1923 in Lowell, a city at the river Grand in the North-Eastern State of Michigan. He was the youngest of a family of three children, with an older brother Lyle and sister Emma. 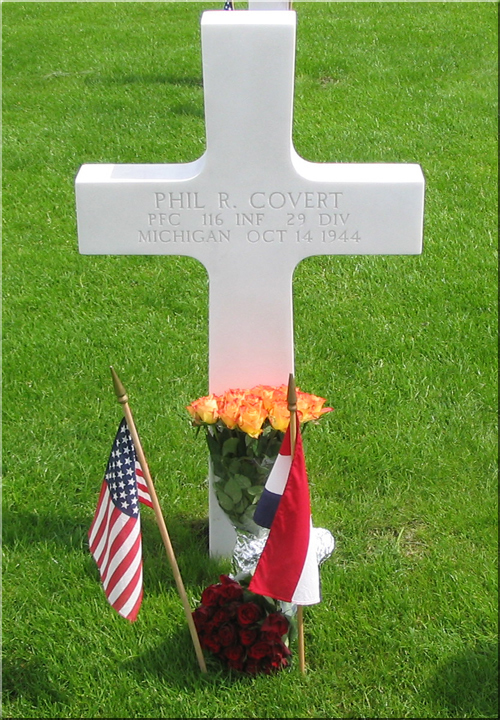 His name is Phil R. Covert, Private first class serving with the 116th Infantry regiment of the 29th Infantry Division. 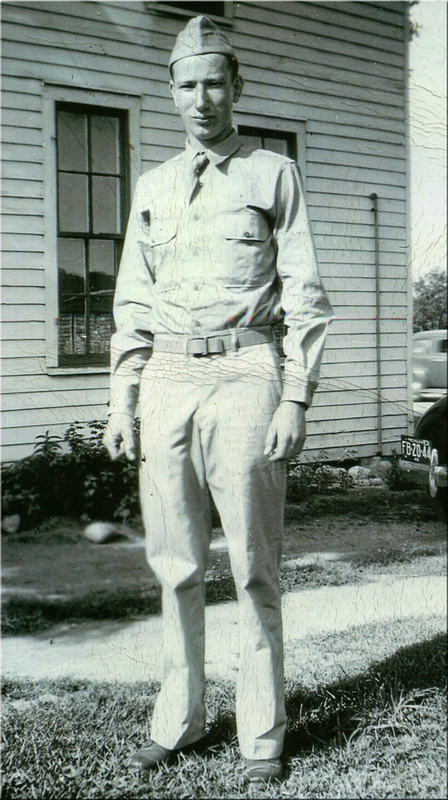 He was rewarded the Combat infantry Badge and the Purple Heart. 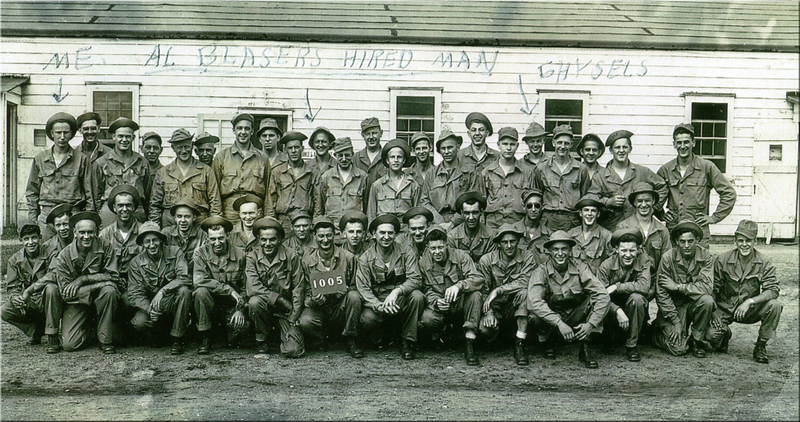 The U.S. Army's 29th Infantry Division has a long and illustrious history. Aside from a 17-year hiatus between 1968 and 1985, the division has existed continuously since 1917 and has fought in many of America's fiercest and most decisive battles of the 20th century. The 29th, nicknamed the "Blue and Gray Division" because its component units were originally drawn from regiments that had fought against one another during the American Civil War, has been a National Guard division since its inception. Indeed, ever since the 29th was first organized in 1917, Maryland and Virginia National Guard troops have comprised the bulk of the division. During both World Wars, the 29th Division earned a fighting reputation second to none. In the First World War, the 29th fought in the trenches on the Western Front and actively participated in the U.S. Army's October 1918 Meuse-Argonne offensive, one of the largest American military operations in history, and one which helped to bring the war to a close in favor of the Allied powers. During the Second World War, the 29th Infantry Division played a decisive role yet again when it successfully assaulted Omaha Beach on D-Day, june 6, 1944, as part of the great Allied amphibious invasion of German-occupied France. The D-Day landings were a turning point in World War II and the beginning of the end for Hitler's Nazi Germany. Later the 29th participated in the Normandy campaign, liberating the vital Norman crossroads city of St.Lô on July 18, 1944. Subsequently the division played key roles in the Normandy breakout, codenamed "Operation Cobra," the liberation of Brittany and its critical port of Brest, the Rhineland campaign in Holland and Germany, and the final defeat of the German Army east of the Rhine River. The 29th Infantry Division exists today as a "light division," the only such division in the U.S. Army comprised entirely of National Guard troops. Recently elements of the 29th Division (Light), under the command of Maj. Gen. H. Steven Blum, deployed to Bosnia for several months and played a key peacekeeping and anti-terrorist role there. Other 29th Division units have been mobilized for pivotal Homeland Security duties. He was killed on 14 October 1944 near Baesweiler in Germany. Baesweiler is a town only a few kilometers from the Dutch-German border. 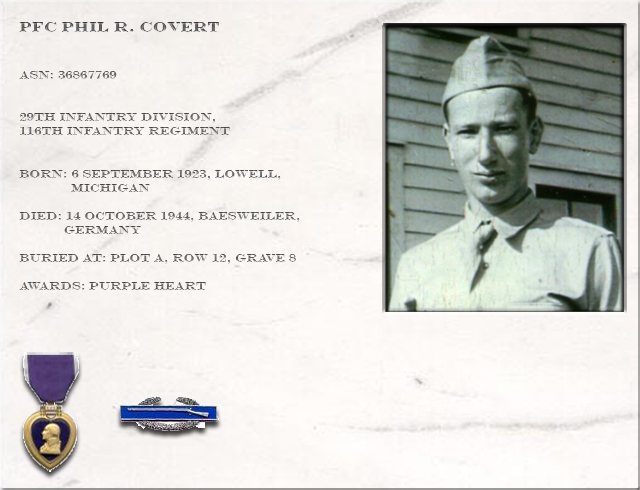 He was killed in the actions of the U.S. Army trying to close in on the Ruhr area. He died of a severe wound to the head. We are still in contact with Phil's niece Peggy and nephew Bill, both children of Phil's older brother Lyle, who died in 1995. Phil's sister Emma died in 1965. Esther Smeets , caretaker of the grave of Pfc. Phil R. Covert.